Originally consisting of a relatively low dome, stupas in Gandhâra and Afghanistan evolved towards higher edifices. This stupa, from the Hadda site, comprises a base which supports four successive square and cylindrical stories. The main sections of stupas were being increasingly covered with narrative images and reliefs, in this instance a series of Buddhas punctuated by pilasters featuring capitals of remote Corinthian inspiration. Carved incisions pick out the drape of the robes and highlight the facial features of the figures represented. The monument, hastily erected on a rough structure of earth and rocks, and coated in stucco, bears polychrome traces-a reminder that such edifices were originally painted; similarly, vestiges of gold leaf reveal that these columns were also gilded. The heads of the figures have not been cast but are executed individually, each in a specific manner. 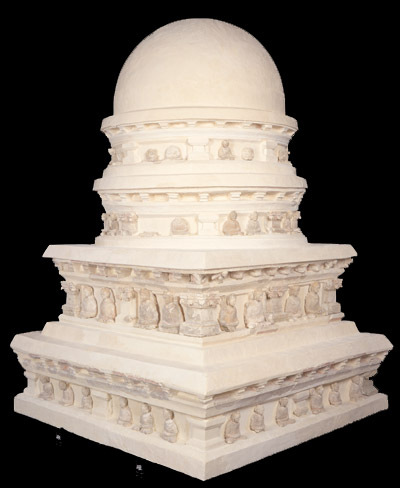 Stupas are solid monuments, the dimensions of which can vary from the height of an average person to several dozen meters. Built to be conspicuous, and to be walked around according to the rite of pradaksina, they were essentially commemorative monuments and symbolically evoked parinirvâna. Most of them housed a foundation depository often consisting of relics. Discovered in a Buddhist complex of several monasteries, the central courtyard of which featured a large number of votive stupas, this work attests to the growing importance of the monastic community towards the 4th and 5th centuries CE. As they assumed an increasingly central liturgical role stupas tended to be erected more and more hastily. Although quality may have declined, the sheer number of such monasteries boasting several hundred polychrome, gilded stupas must have made an unforgettable impact on the faithful, as Chinese pilgrims have testified.